Owning a cat and taking good care about your fenine champion is not a piece of cake. Most of the cat owners always face a tough time while feeding their cats. They get confused in between dry and wet cat foods. Cats usually love wet food, and you can feed your furry buddy with wet food on a regular basis. But it is a tricky task to determine how often should I feed my cat wet food and cat owners needs to calculate a lot of things before feeding the cat. Most people think that cats only need wet food occasionally and gives it as a treat now and then. But its completely wrong. You can feed your wet cat food every day and consult a veterinarian to get your cat feeding schedule. Veterinarians give you cat feeding guide by weight. You can feed an average sized cat with 6 oz can cat food where you can use a feeding calculator. There are a lot of factors that determine the amount of wet food you need to feed your cat. For a healthy adult cat, you can take 1/3 ounce can per 3 to 3-1/2 pound of body weight. According to the New York Animal medical center, an active adult cat requires thirty calories per pound. So, if your cat weighs 10 pounds, you need to feed 300 calories per day. Using this weight guide, you can feed a 10-pound cat with a full of 6 oz cat food and 4/5 cup of dry food. Adjust the total proportions based on your cat’s preferences. You can adjust the amount of wet food depending on the amount of dry kibble you feed your cat. Also, you need to check your cat’s health and many other factors. You can feed the cat at any time of the day. You can not leave the wet food outside for more than half an hour. It would get spoiled if your cat didn’t eat it. So, you need to keep in mind about your at’s eating habits and feed it at the right time. You can leave dry food outside all day. You can also mix dry and wet food in each meal based on your cat’s preferences. Most of the cats love wet food, and you can hear nom sounds while they are exploring the blast of wet food all around their mouth. Make sure the wet food is at room temperature because cats do not like cold food. After refrigerating wet food, take it out for sometime before feeding to set it at room temperature. Before serving wait for 15 minutes and then pop the wet food into your cat’s feeding plate. Cats enjoy the combination of different textures. You can try mixing dry and wet cat foods to make interesting food patterns and make your cat enjoy its delicious food every day. If your cat is picky, you can surprise it with various flavors of dry and wet foods in every meal. You can also add a topper or complement to make the meal more interesting. Adding additional treats to your cat’s food creates bonding between you both and makes your cat feel special. But do not forget to exceed the daily limit of calories and keep the food in a limit. Refer various recipes of combination foods and follow the directions. Take a slice of salmon or your cat’s favorite fish piece as a topper and see how your cat will finish everything on the plate quickly. Make a how much to feed a cat chart in your free time and stick to the plan to take good care of your cat’s feeding schedule. Depending on the age and weight of your cat, you can follow this chart to make sure your cat is eating enough calories per day. If you Kitten weighs five pounds of body weight it requires 200 calories a day. Lean domestic cats might need 170-440 calories per day based on the weight for their body. For example, a five-pound domestic cat body type needs 170 calories per day. A 15-pound lea cat needs 380 calories per day. For overweight domestic cats, you need to limit the calories but keep up with the nutritional values of the cat. If you cat weights 10 pounds, it requires 240 calories a day. For pregnant and nursing cats, you must feed more. A five-pound nursing or pregnant cat needs 336 calories per day. For 15-pound pregnant cat, you need to feed 851 calories per day. It’s acceptable to use all these feeding recommendations from the beginning for your pet’s feeding journey. Soon after weaning, you can start feeding wet food. But make sure you are following right kind of diet chart and feeding guidelines. If your cat does not like the food combinations, you can adjust the food types. 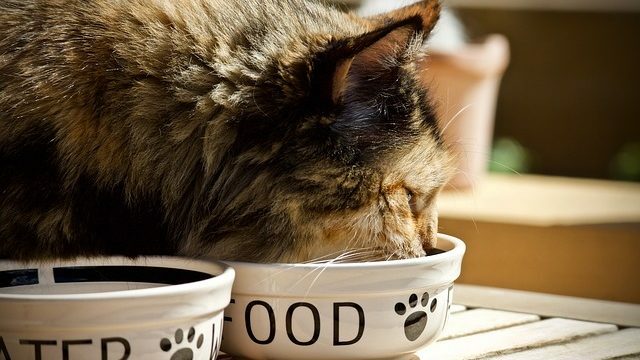 Feeding the right type of food can keep your cat healthy physically and mentally. Wet food needs to be stored in the refrigerator, and it will get spoiled quickly if you keep it outside for a long time. If your cat doesn’t get all the food on her plate, you can store this food in the sealed container in the fridge for three days. Furry cat balls stay happier when you feed them with delicious treats. Take a little time and while feeding it, stay around so that they feel good. So next time you are worrying about How Much Wet Food Should I Feed My Cat helps you in time.